are CONNECTED and IN EFFECT! Is there a definite link between the Ten Commandments of Exodus 20 and Deuteronomy 5 and the Holyday Statutes of Leviticus 23? If there is, and it can be proven that the Holydays are still in effect during this New Testament period, then will this also prove that the Commandments as well are still in effect, and must likewise be observed to properly worship the true God in spirit and truth? This article will help prove that such a link exists, and that the Commandments and Holydays are BOTH still in effect TODAY, that they were NOT annulled by the New Testament, and that they must be obeyed TODAY, NOT for justification, but rather for showing God and ourselves that we truly want to live that pattern and way of life for an eternity. First, where is the LINK between the Commandments and Holydays? Which one of the commandments has the same subject matter as the Holydays? The Holydays are focused on how to worship God. Leviticus 23 specifies gathering together for “holy convocations” at “appointed times” at which certain rituals and ceremonies are to be performed as the proper worship service required by God. So the HOLYDAYS are focused on the PROPER WORSHIP of the true God. Now, which one of the Commandments deals with this same subject matter of PROPER WORSHIP? Doesn’t the Second Commandment deal with PROPER WORSHIP, by specifying what is NOT to be done in worshiping the true God? Doesn’t it prohibit using “graven images” as tools to assist in worshiping God? But notice that the Second Commandment does NOT specify exactly what is allowed or supposed to be used in the PROPER WORSHIP of God. Is it because somewhere else in the Scriptures the Second Commandment is linked to these PROPER WORSHIP instructions, that is, the Holyday Statutes contained in Leviticus 23? Is there a chapter in the Scriptures that explicitly links the PROPER WORSHIP of the Holyday Statutes with the Second Commandment? Yes, there is! Read Deuteronomy 4, specifically verses 12-19. 12 “Then the LORD spoke to you from the midst of the fire; you heard the sound of words, but you saw no form – only a voice. 13 “So He declared to you His covenant which He commanded you to perform, that is, the Ten Commandments; and He wrote them on two tablets of stone. 14 “The LORD commanded me at that time to teach you statutes and judgments, that you might perform them in the land where you are going over to possess it. 15 “So watch yourselves carefully, since you did not see any form on the day the LORD spoke to you at Horeb from the midst of the fire, 16 so that you do not act corruptly and make a graven image for yourselves in the form of any figure, the likeness of male or female, 17 the likeness of any animal that is on the earth, the likeness of any winged bird that flies in the sky, 18 the likeness of anything that creeps on the ground, the likeness of any fish that is in the water below the earth. 19 “And beware not to lift up your eyes to heaven and see the sun and the moon and the stars, all the host of heaven, and be drawn away and worship them and serve them, those which the LORD your God has allotted to all the peoples under the whole heaven. The above verses explicitly cite the Second Commandment in the context of keeping the “Statutes”! Deuteronomy 4 is all about keeping the Statutes! See how many times the word “statutes” is mentioned. The first mention is in verse 1, and the last mention is in verse 40. The Holyday Statutes are these specific instructions on how to properly worship God, and the Second Commandment was aimed to protect that PROPER WORSHIP by explicitly prohibiting the IMPROPER WORSHIP that was very prevalent at that time, and which still is TODAY, by the very fact that the Holydays are NOT being observed today because of that very same idolatry, except the “graven images” today are more mental than physical, namely the ideas and concepts “engraven” into our minds from infancy that cause us to worship nature and human-devised constructs (big bang, evolution, heliocentrism, gaianism, gnosticism). These Holydays are also mentioned in Exodus 23:14-17, Exodus 34:18-23 and in Deuteronomy 16:1-17 because these days are very important to God. These Holydays are how man-kind can establish and maintain contact with the true Creator God, then and now, so that His WAY to eternal life can be communicated, learned and internalized. So, given that the Commandments are linked to the Holydays via the Second Commandment, can we now establish that Holyday-keeping is still in effect in this New Testament period? 16 Then it will come about that any who are left of all the nations that went against Jerusalem will go up from year to year to worship the King, the LORD of hosts, and to celebrate the Feast of Booths. 17 And it will be that whichever of the families of the earth does not go up to Jerusalem to worship the King, the LORD of hosts, there will be no rain on them. 18 If the family of Egypt does not go up or enter, then no rain will fall on them; it will be the plague with which the LORD smites the nations who do not go up to celebrate the Feast of Booths. 19 This will be the punishment of Egypt, and the punishment of all the nations who do not go up to celebrate the Feast of Booths. Clearly, the Feast of Booths (Holyday 6) will be enforced upon all nations when Christ returns to rule the world during the Millennium. Holyday-keeping will be ENFORCED during the Millennium BECAUSE the Law and Statutes are still in effect during the New Testament period! Christ’s life and teaching did NOT annul any part of the Law or the Prophets. Therefore, if the Holydays are still in effect during this New Testament period, including the Millennium, why wouldn’t the Commandments also be in effect, especially since the Second Commandment is meant to protect and preserve PROPER WORSHIP of the true God which is the purpose of keeping the Holydays? And many of the Scriptures support that the Commandments are still in effect. The efforts to diminish the importance of the Second Commandment reveals just how important it truly is for PROPER WORSHIP of the true God. 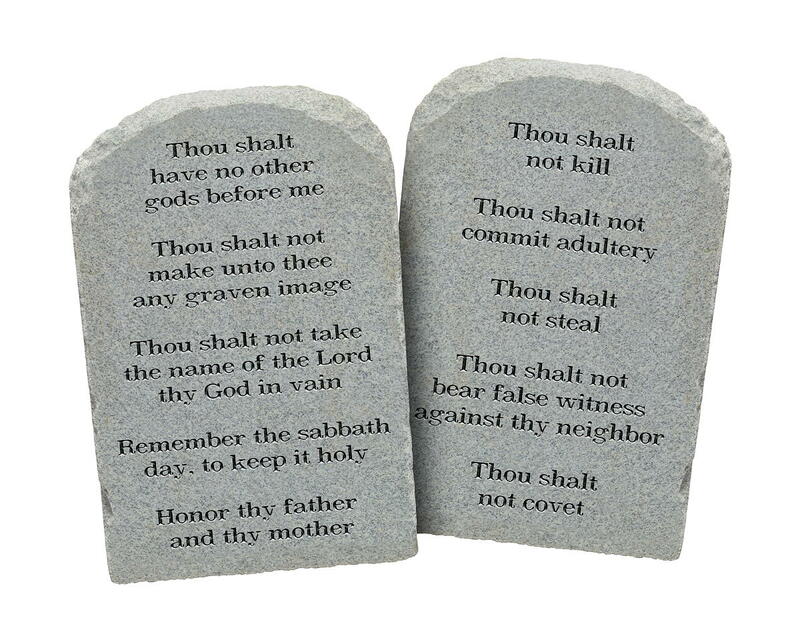 Others are saying the Second Commandment is just a “regulation”, grouping it under the First Commandment, instead of it being on a separate and equal basis with the other nine Commandments. Then, in order to keep the total number at ten, a new Tenth Commandment is seen as the words that Moses spoke in Exodus 20:20 about fearing God, even though Moses had not received chain of title to the office of “spokesman” for God until Exodus 20:22 in order to make those words a commandment, and even though Deuteronomy 5:6-21 lists exactly the complete Ten Commandments, and the very next verse Deuteronomy 5:22 does not mention the words “do not be afraid” in Exodus 20:20 as a commandment. In fact, it says “and He added no more” to “these words” that He commanded in Deuteronomy 5:6-21 , in which verse 21 is the last and tenth commandment, namely “You shall not covet…”. 22 “These words the LORD spoke to all your assembly at the mountain from the midst of the fire, of the cloud and of the thick gloom, with a great voice, and He added no more. He wrote them on two tablets of stone and gave them to me. So the merging or grouping of the first and second commandment is NOT supported by the Scriptures when Deuteronomy 5 is seen on an equal footing with the Scriptures in Exodus 20, even as the Messiah declares in Matthew 4:4 “Man shall… live on EVERY word that proceeds out of the mouth of God”, and 2 Timothy 3:16 states that “All Scripture is inspired by God and profitable for teaching, for reproof, for correction, for training in righteousnesss.” Also notice that Christ cited Deuteronomy, NOT Exodus, three times during His temptation in wilderness with Satan (Mt 4:4,7,10), and again cited Deuteronomy when explaining what is the greatest Commandment (Mt 22:37). So Deuteronomy is a very important book! Now, the only grouping of the Ten Commandments that is supported by the Scriptures is located in Matthew 22:35-40, where Christ groups them into two commandments – 1) Love of God being the “great and foremost commandment”, and 2) Love of neighbor as yourself. So it appears that the efforts to diminish the importance and independence of the Second Commandment is really an attack on the PROPER WORSHIP of the true God. It is an attack on KEEPING THE HOLYDAYS! Now, given the above LINK in Deuteronomy 4:12-19 connecting the Commandments and Holydays, and that these both are in effect TODAY, what is the implication of our NOT obeying these clear commands and days? Read the entire chapter of Deuteronomy 28. Are we experiencing any of these curses today? In fact, isn’t our current captivity the direct result of NOT keeping the Holyday Statutes? 23 “Also I swore to them in the wilderness that I would scatter them among the nations and disperse them among the lands, 24 because they had not observed My ordinances, but had rejected My statutes and had profaned My sabbaths, and their eyes were on the idols of their fathers. These Israelites were taken captive by the Assyrian Empire into the area near the Caspian Sea and the Caucasus Mountains as a direct result of rejecting the observance of the Second Commandment and the Holyday Statutes. These people became known as “Caucasians”. We in America used to mark “Caucasian” as our race on various registration forms, but now that category has been removed because it is a clue to our true identity and heritage, and our continuing responsibility and mission to uphold the bilateral social compact agreement (the covenant) that our ancestors made with the Most High at Mount Sinai, the terms of which included keeping the Commandments and the Holydays, with each Holyday being “a perpetual statute throughout your generations in all your dwelling places” (Lev 23:14). What we need today is another “King Josiah” who upon being presented with the Book of the Law during his reign as king over the House of Judah, realized that they were breaking the terms of this covenant their people had made with the Most High, and quickly restored the observance of the Commandments and the Holydays. Read 1 Chronicles 34-35 to see the example that was set by him in causing “the sons of Israel” to keep the Holydays (Passover and the Feast of Unleavened Bread – Holydays 1 & 2). We need that same Restoration today! And the GOOD NEWS is that this Restoration is going to be accomplished by the NEXT TWO HOLYDAYS! That is the primary Mission of this website – to proclaim the GOOD NEWS, in accord with Isa 41:27, of the fulfillment of the Second and Third Annual Holydays to occur “in Jacob” (Ps 98:1-3; 99:4; 87:2) where most of the “Caucasians” live – The United States of America! Read the article entitled “The REVIVAL” to see how this will happen. That GOOD NEWS means that many from ALL NATIONS will gather to America after the Desert Miracle occurs because they will realize that the Commandments and the Holydays ARE STILL IN EFFECT – BECAUSE HOLYDAY TWO has just been fulfilled, and that they are thereby convicted about their mission to fulfill HOLYDAY THREE as the Bride and Wife of the Messiah whose Marriage will produce the First Fruits Spring Harvest of the Kingdom-Family of God, the HOLY PENTECOST NATION! This article has proven that the Commandments and Holydays are CONNECTED, and that BOTH are still IN EFFECT TODAY, that they were NOT annulled by the New Testament, and that they must be obeyed TODAY, NOT for justification, but rather for showing God and ourselves that we truly want to live that pattern and way of life for an eternity.